One year ago, if you told an average person you were thinking about buying an Android, they'd have thought you were some sort of robot-mongering madman. Since the debut of the first Android handset in 2008, we've seen Google's mobile operating system grow in leaps and bounds. Initially catapulted by the high-profile marketing push surrounding the Motorola Droid, Android sales have been on a nonstop rocket ride upward. Smartphone users are now snatching up more Android phones than iPhones -- despite what certain turtleneck-loving CEOs may imply -- and the ratio shifts further in Android's favor with practically every passing month. Now, a new report finds Android has essentially matched the iPhone when it comes to overall consumer interest. If recent trends are any indication, it won't be long before Apple's prized product is eating Google's dust. The Android-iPhone study, conducted by independent research firm ChangeWave, looks at the mindsets of smartphone consumers planning to purchase new devices within the next 90 days. ChangeWave interviewed 4,000 people for the report. 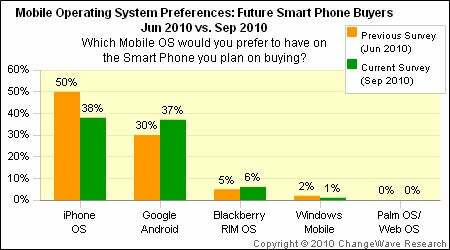 According to the company's data (chart available here), 37 percent of prospective phone buyers want an Android in their pockets. That's up 7 percent from the firm's previous study in June and, as ChangeWave VP of Research Paul Carton puts it, represents "a six-fold increase in consumer preference for the Google OS" over the past year. Thirty-eight percent of smartphone shoppers, meanwhile, currently have the iPhone in their sights. That's down 12 percent from Apple's level in June. You could write off the drop as being a result of the fading hype from the release of the iPhone 4, but the shift is nothing new. We saw the same sort of changes back in January, and the vast majority of analyses over the past year have indicated similar movements as well. We could argue endlessly about the merits of one platform over the other. Ultimately, though, a smartphone is a personal thing -- and finding a phone that strikes your fancy comes down to your own personal preference. There is no absolute right or wrong answer. That said, the iPhone offers a single setup: one phone, one form, one largely unchangeable software experience. If you like that setup, you've found the phone for you. But if you prefer anything different -- be it a larger display, a physical keyboard, or a home screen with anything beyond neatly aligned static icons -- you aren't going to find it in Apple's garden. On the other side of the spectrum, you have Android. Some Android phones are great. Others...not so much. But taking into account both hardware and software, there's no shortage of options. And within those options, there's no shortage of diversely attractive possibilities. Apple's iPhone will undoubtedly have a dedicated group of followers for many years to come. And Apple will likely have no trouble turning a handsome profit from its mobile portfolio. But as the number of Android-based options continues to expand, so too will Android's grasp on the mobile market. You don't have to be a robot-mongering madman to see the logic in that. JR Raphael is a PCWorld contributing editor and the author of the highly scientific Apple/Android Fanboy Quiz. You can find him on both Facebook and Twitter.